Nothing really much to say. I'm just procrastinating going to work today. I do this every Friday. I wait & wait & wait. And wait some more. And then I have, like, 12 minutes to get ready. It's so cold out there. I'd much rather sip some sort of hot yummy drink & stay cozy under these blankets. The first part of my Friday newspaper job involves walking around town (up & down Main Street mostly) & visiting with businesses to collect their ads for next week. If it weren't so cold, maybe I wouldn't be procrastinating so much. (Nah, I still would.) But then the fun begins. I plop down at the computer (with my duo screens & fancy programs that I don't really know much about) & get to create the ads. That photo up top was taken when the Mr. & I had a coffee date on Wednesday. I LOVE Valentines Day. Like, love-love-love it. 2nd place to Christmas. A CLOSE 2nd. 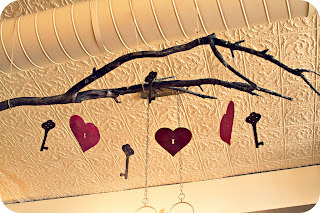 That V-Day installation is simply a groovy branch & cardboard cutouts of hearts & keys. Adorbs. It hangs in a gift shop/flower shop/coffee shop in town called The Tarnished Halo. The only "cool" place to hang out, really. (Besides the library.) If they had a couch & music, it'd be perfection. (Even the library has couches.) The space is amazing. Just look at that old ceiling! I'm at my 17 minute mark right now. Random: I think I may have succeeded in getting the Mr. hooked on the show "Once Upon a Time". (I LOVE that show!) The jury is still out, but I'm thinking a weekly TV date may be put into action very soon. I'm totally excited about the next several days. The fam is headed to Kearney, NE on Monday, to a Pastor's retreat---which is simply 4 days of speakers & worship music & connecting up with other pastoral peeps. We went last year & got the coolest hotel room. It was gi-normous. The hotel is kinda old, but the room was BIG. The girls BOTH built forts with chairs & sheets. The girls will miss 4 days of school & I've already asked their teachers to load 'em up with schoolwork. So, we'll be doing a bit of hotelschooling. It's like homeschooling, only different. I'm hoping to meet up with a friend there (neighbors who actually moved to Bridgeport mere months before our family arrived). Sarah has already teased me by mentioning a fabulous knitting shop in town & a stop by her favorite coffee hangout. Bring it on!! Ok, 12 minutes until I have to be at work. Lol, hotel schooling could be the next big thing, i am digging it! Go check the yarn shop out and embrace the four days!